The accountability agenda has risen to occupy a prominent place in the efforts to promote development. Much of focus on accountability, however, has taken a technocratic view, emphasizing disclosure of information and legal processes. The Citizenship DRC sought to bring another perspective to accountability by looking at the strategies that citizens take to claim accountability from below. The research hypothesized that these bottom-up strategies would be increasingly important in the context of shifting relationships across the state, civil society and market. The work also assumed the perspective that accountability cannot be separated from contests over the realisation of rights and the distribution of resources. The research explored these issues in South Africa, Mexico, Brazil, Kenya, Nigeria, Bangladesh, the US, India and other countries. Newell, Peter and Joanna Wheeler, eds. This two-page document summarises research into the Bangladesh garment export sector, showing that a context where companies adhere to codes of conduct is not the same as a culture of accountability where citizens mobilise to hold their employers and other companies to account. This two-page document summarises research into the strategies taken by tenement housing residents to claim their rights. 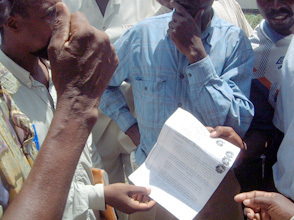 This brief research summary describes how Researchers from the Theatre for Development Centre (TFDC) at Ahmadu Bello University used participatory theatre as a methodology for encouraging discussion among communities of the Niger Delta on the breakdown in accountability of local and state leaders to citizens. This two-page document describes an action research project that sought to restore accountability in the management of water resources - through institutions that linked indigenous communities in the hills of southern Veracruz and municipal governments along the coast. In P Newell & J Wheeler (eds) Rights, Resources and the Politics of Accountability. London: Zed. Many conflicts in development can be understood as struggles by the poor to hold the powerful to account. Contests over the rights and responsibilities of actors in development are increasing in intensity amid clashes between the promotion of a rights-based approach to development and market-based notions of access and entitlement to resources. How these conflicts are played out has enormous implications for efforts to tackle poverty and achieve the Millennium Development Goals. Understanding how the poor claim their rights and demand accountability for the realisation of those rights becomes critical. This book contributes to such an understanding by exploring how poorer groups mobilise around rights to resources in a diversity of settings, employing a broad range of strategies to achieve accountability. It places accountability at the intersection between rights and resources, asking: what is the relationship between greater accountability and peopleâs ability to realise their rights to resources? A policy briefing which looks at the central debates on accountability, dispels some myths, identifies some cases drawn from recent research on citizen participation and accountability and addresses policy implications. many development and rights practitioners. Consequently, historical insights applicable to todayâs challenges of inequality and exclusion often remain untapped.Drawing on our 30-year practical experience and related research on these efforts, this article will examine three main areas of past innovation and thinking that link rights and participation and explore how they address power and encourage critical consciousness and citizenship. First we will trace diverse historical and conceptual streams shaping participatory approaches, and then will examine specific legal rights strategies and womenâs rights experiences from the last several decades. These reflections arise from two related concerns. First, the worsening conditions of poverty in poor countries despite numerous development projects by governments and non-governmental organisations (NGOs) aimed at improving lives of poor people. Second, the phenomenon of parallelism(or even hostility) between development and human rights programmes, at least in Kenya. take account of the contribution that grassroots movements make to the practice of human rights. This paper investigates how, when and why community-based strategies are effective in promoting corporate accountability to the poor. It argues that mainstream approaches to corporate social responsibility (CSR) underestimate the importance of power in the relationship between corporations and the communities they invest in, which limit their applicability to many developing country contexts in particular. In helping to address this neglect we draw on literatures on power, accountability and citizen participation in order to analyse 46 cases where communities have attempted to hold corporations to account for their social and environmental responsibilities. The paper argues that more attention should be paid to a number of state-, corporation- and community-related factors, which are found to be key to the effectiveness of strategies aimed at providing corporate accountability to the poor. This study looks at an industrial zone where the government and the industries have started the process of development with specific goals and objectives. The study also provides a glimpse of the various stakeholders and their understanding and experience in the industrial development process and their role as stakeholders in seeking and negotiating for accountability from the dominant groups. The paper concludes that the many parties involved in the process need to have a common vision or they function at counter purposes. A silent and invisible stakeholder is the ecosystem; unless and until this ecosystem is not safeguarded and its destruction prevented, the stakeholders will not achieve much. Industrial development can contribute to sustainable development only if the industries and the government recognise the rights and importance of the various stakeholders and decide the development process in unison. Este documento ofrece una visiÃ³n general sobre los usos y aplicaciones polÃ­ticas del tÃ©rmino ârendiciÃ³n de cuentasâ 1 en el discurso y las prÃ¡cticas de desarrollo contemporÃ¡neas. La primera parte aborda los orÃ­genes histÃ³ricos de los diversos y contradictorios recuentos sobre el tema, y lo que significa rendir cuentas para los actores y los procesos en que estÃ¡n inmersos. La segunda secciÃ³n versa sobre las herramientas, estrategias y procesos de rendiciÃ³n de cuentas en escenarios formales e informales, evaluando el papel de la ley, de la protesta y de una diversidad de enfoques gerenciales para la creaciÃ³n de mecanismos de rendiciÃ³n de cuentas. La tercera secciÃ³n analiza la manera en que los recuentos sobre una diversidad de prÃ¡cticas de rendiciÃ³n de cuentas se refieren a los actores clave del desarrollo, tradicionalmente al estado-naciÃ³n, pero tambiÃ©n cada vez mÃ¡s a la autoridad pÃºblica en los niveles supra y sub-estatal asÃ­ como a los sectores privado y no-gubernamental. El argumento que aquÃ­ se desarrolla es, en primer lugar, que en el derecho a exigir y en la capacidad y disposiciÃ³n para responder a dichas exigencias, se expresan relaciones de poder. El hecho es que la funciÃ³n misma de la rendiciÃ³n de cuentas es asegurar que quienes ejercen el poder a nombre de otros asuman la responsabilidad de sus actos. En segundo lugar, estas relaciones de poder tienen una dinÃ¡mica de flujos, que refleja las conflictivas relaciones entre los actores del estado, de la sociedad civil y del mercado. Estas relaciones por un lado generan y por el otro limitan las posibilidades de nuevas formas de rendiciÃ³n de cuentas en la medida en que producen transformaciones concretas en la organizaciÃ³n de la autoridad polÃ­tica. In the early 1990s, in Mexicos state of Oaxaca, an organisation made up of four indigenous communities in the Sierra JuÂ·rez, the UZACHI, negotiated a bioprospecting contract with the multinational pharmaceutical company Sandoz. The local civil society (CS) actors directly involved in negotiating and carrying out the project consider their bioprospecting experience a positive one that could contribute significantly to the communities longer term sustainable development process. In contrast, neighbouring community representatives and CS organisations, as well as NGOs of national and international scope, publicly condemn the initiative. In this article the UZACHI-Sandoz case is employed to illustrate the challenges associated with civil society accountability (CSA) in the context of a struggle for contested rights associated with biodiversity conservation and development. In looking at civil societys role in Mexicos debate around bioprospecting, it explores a number of questions that are raised regarding the way CS representation, responsibility, and voice are played out. In south-eastern Mexico, indigenous communities and civil organisations are striving to influence national policy around property, production and environmental issues. These struggles are integral to these groups broader demands which call for recognition of their identities, rights and cultures. However, the voices and claims of indigenous groups are at odds with the wider official discourse of globalisation and economic integration. A central issue that highlights the conflict between broad macro visions of development, and local indigenous visions, is that of ownership, use and management of natural resources. This article seeks to contribute some theoretical elements to the analysis of the use and management of natural resources, and to show how this relates to wider debates about development. This paper provides an overview of the political uses and applications of the term accountability in contemporary discourses and practices of development. The first part reflects on the historical origins of competing narratives of accountability and what it means for actors, and the processes in which they are embedded, to be accountable. The second section looks at tools, strategies and processes of accountability in formal and informal arenas, assessing the role of law, protest and a variety of managerial approaches in the creation of mechanisms of accountability. The third section looks at how the narratives of accountability, manifested in these diverse practices of accountability, apply to key development actors, traditionally the nation-state, but increasingly also public authority at supra and sub-state levels and the private and non-governmental sectors. There is now widespread debate about the rights and responsibilities of global corporations. Increasingly the language of citizenship is being invoked in order to understand the relationship between rights and obligations. This paper seeks, firstly, to locate this debate historically, by looking at how understandings of accountability have evolved alongside shifts in thinking about the role of key actors in development. The second section interrogates the relationship between corporate accountability and citizenship, exploring the way in which early emphasis on the social responsibilities of firms has been eclipsed by claims about their entitlements as citizens. The third section looks at the extent to which notions of corporate citizenship can be meaningfully applied to relations between mobile capital and poor communities. It is suggested that depoliticised notions of citizenship as partnership serve to obscure the power inequities that characterise such relationships. Drawing on examples from North and South where poor communities have been negatively affected by the investment practices of multinational companies, the fourth section suggests the circumstances in which poor communities may be able to construct new relations of accountability with corporations.